Alright, I'm going to try really hard not to go on and on about Jennifer Buck since I know you've all heard it from me before. She's a new SCS Dirty Dozen gal and I'm so happy for her. This week, I CASEd (copy and share everything) Jennifer twice. Once for a challenge that Angela from Unity gave us. And once, today actually, for Sharon's Stamp Simply challenge. Now, it's so easy to be inspired by Jennifer but really hard to make things as nice as she does. The girl is SO clean and crisp in her design! She's super creative too! 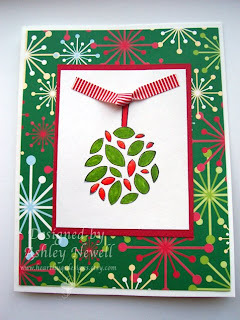 Who would think to turn the TREE in the first card into mistletoe? Genius, I tell ya! And her altered items are amazing. I am not talented enough to CASE one of those though. These are both great! 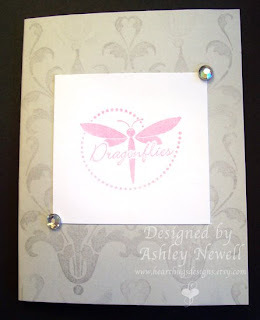 I love the holiday card with the bright colors, but love the softness of the dragonflies!